I start to think that Prime Minister Viktor Orbán and his inner circle have lost touch with reality. 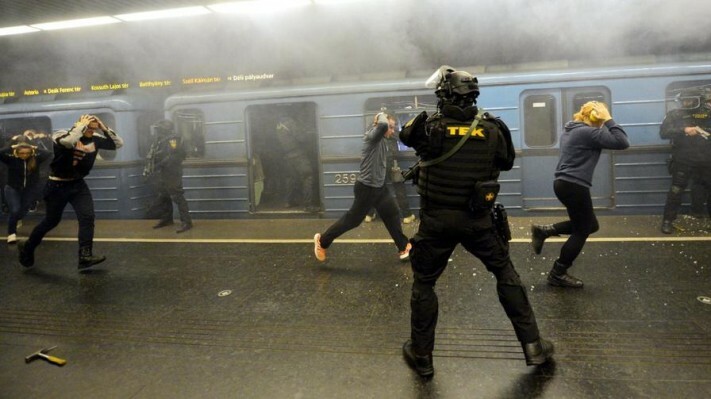 Police forces conduct anti-terror training exercises in other EU countries, but it is unprecedented that a night-time police drill is staged as a propaganda tool for a sitting Prime Minister. A couple of days ago Mr. Orbán invited journalists and politicians to watch a night mock attack on the platform of a Budapest subway station. TEK (Terrorelhárítási Központ), the national counter-terror police, responded to heavily armed actors playing terrorists. Viktor Orbán with TEK officers during the simulated terrorist attack in Budapest. “Today, Hungary is a country strong enough to provide the same security equipment, and the same attention to its soldiers, policemen, and counter-terrorism units, that any other developed Western-European country does.” – stated the beaming Mr. Orbán. The police actors were swinging AK-style rifles and attacked people as the “terrorists” attempted to behead civilians. To increase the suspense, you can hear shouts of “Allahu Akbar” in the Hungarian government’s promotional video. Hungary has not experienced terrorism linked to migration, and since Mr. Orbán has sealed the small country’s southern borders there are no migrants at all and Hungary itself has a very small Muslim population. Recently there was an unexplained smaller explosion in Budapest with two injuries, but at this point little is known about the event or the motivation behind it. Many say that the main purpose of the drill was to instill fear in the Hungarian public and provide a photo op for Mr. Orbán to solidify his image as savior of the nation from the flood of Muslim migrants. 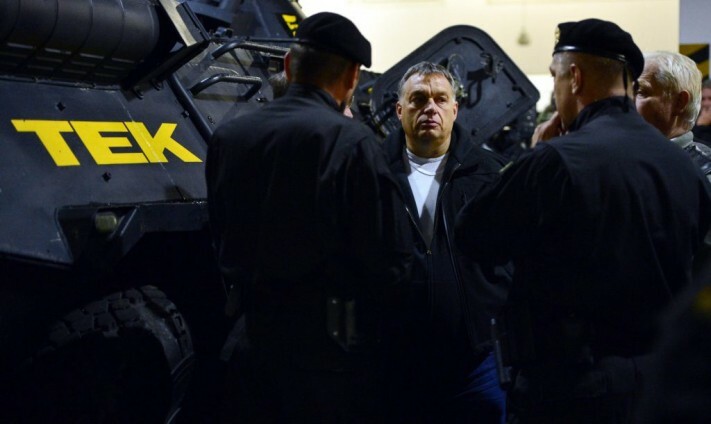 Mr. Orbán did not hide the fact that the drill is a publicity event, he gave a stump speech. Hungary is turning into the EU’s first police state. Click here to watch the video of the drill. Who knows why they do it. This kind of drill can be a warming up a prep for anything, and then they only have to decide whom they call a terrorist. Meanwhile, it might as well be what it is called. 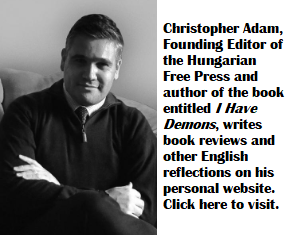 Eventually terrorism is rampant in Europe and Hungary has experienced a huge explosion recently that seriously injured to cops. Anyway, although they might abuse their power and the power of the TEK against civilians, it is not irrational and not groundless to be prepared for the worst. Your rational is idiotic. A fake drill does not prepare for anything except maybe to act in a b-rated TV serial. Under the Orban mafia regime the Parliament and National Bank have special police forces in addition to the TEK whose members get twice the pay of what the police get and swore loyalty to Orban. All these armed groups are designed to quell any potential uprising. Orban has stated repeatedly that Erdogan is one of his idols. Ironically the propaganda stunt was performed on a subway line that has much more chance to experience an accident, due to it’s age and poor technical conditions, than an islamist attack. It would be more intersting to the public to know, how prepared are the authorities to the former. One more thought about this problem. Correctly: did not experienced terrorism linked to migration YET. Please be careful composing your sentences, you don’t know what is going to happen tomorrow and your words might backfire and will justify Orban. Carefully please. BTW, there are ten thousand migrants in Hungary mostly in open refugee camps who applied for asylum. Many of them disappeared and escaped from registration and please don’t forget that many of the terrorists who committed terror actions in west Europe broke the fence and entered Hungary illegally and made their way through Hungary to west Europe. I’m personally not a big fan of Orban but I would certainly support him at least in one thing, protecting Hungary from the Islam invasion. I think he is doing the right thing with that. Also, it is impossible to be gullible and to turn bling eyes to the creepy propaganda that promotes the Islamic invasion. People who do that in a real sneaky, creepy way are certainly convinced and believe they will be free from the consequences of their dirty work and will find a shelter once the deed has been done. NO!!! WILL NOT. The Islam will not stop at Europe as it is a part of the globalist NWO and they will knock on your door in the US and in CA too. Your daughter and wife is raped? You’re beaten, you and you’re destroyed? No, you are not, it’s a conspiracy theory. Good luck for the future. Whatever bad things Orban has done I hope he will carry on with his migrant policy. Why should I attack him with the only thing he does well? And a little educational video to open people eyes on how nefarious, flagitious, and creepy is the NWO pro Islamic propaganda. I think a drill is better. I still love Hungary and I hope it will never happen there and Hungary will never become like Sweden or Germany. Propaganda it is, evil and poisoning, but you should have included the photos with the gruesome severed limbs, blood splatter bodies and walls. Such mock set is used in the film making, but not in simulation drills. Such shoking images are always rated and their showing is restricted to later hours, but the Orban regime released them immediately for general viewing. The above prove the ulterior intentions of this despicable character, who, having lost his referendum battle is now trying to shock and scare the population into supporting his obscene positions. then let’s see how others think about it, let’s go one by one as you wish. Let’s start with a Norbert Lichtner interview. Oh I love people calling me an idiot, yes, how said, let’s see what others say, the smart ones, BBC news. You are not alone, most are is bound to become paranoiac, or even idiots, if fed a steady diet of Icke, Lichtner, Irving and co. These characters built up their business shocking people, “unveiling” incredible secrets, world conspiracies and by putting forward radical if nonsensical theories – meet the lunatic fringe. yes they build up their business by shocking people. Let’s see something peaceful. Good relaxing after the shock.